Craig Gmcnab and Friend of Pinole caught 6 trout the largest weighing 5.33 lbs. using power-bait on Sandy Point on 4-1-18. Elyas and Father caught 4 trout the largest weighing 9.4 lbs. using power-bait at Sandy Point. On 4-4-18. Nikko, Tristan, Conner and Mateo caught 9 trout fishing all over the lake using Power-bait on 4/4/18. Logan and Father caught 2 trout using power-bait at Sandy Point on 4-4-18. Pete Gates caught and 8 1/2 lb. trout fishing at the far end boat dock on 4-5-18. 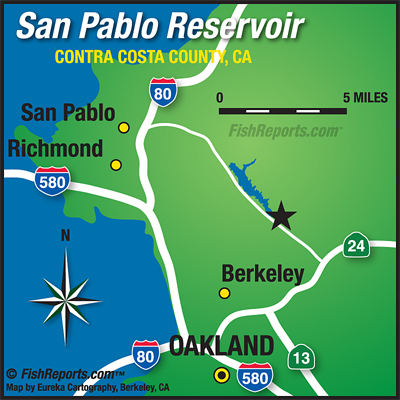 San Pablo Recreation area is open daily the month of April from 6:30am — 7:00 p.m. Boats having to be off the water at:00 p.m. The café is open, Saturday & Sunday from 10am to 4 pm.